Photographs taken by young students recently attracted visitors' attention at the 17th Pingyao International Photography Festival (PIP) in Pingyao, Shanxi province. Initiated in 2001, the PIP unveiled its 17th session on Sept 19 with a theme of "original inspiration; a brighter future", and will last until Sept 25. 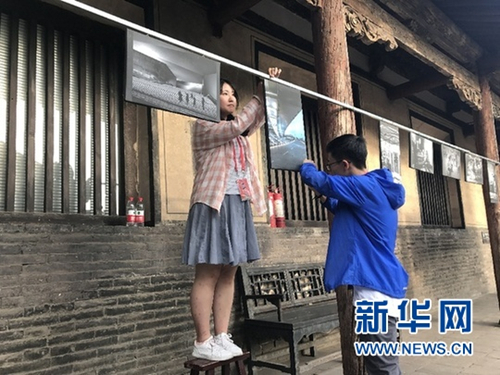 The photographs were displayed in Qingxu Taoist Temple area, and were taken by members of Taiyuan High-school Photography Association –– mainly made up of 12th grade students aged around 17. As the youngest team at the festival, it was the association's first time at the event. Li Wenjing is the person in charge of the association. Li took a keen interest in photography during her childhood, and joined the association two years ago, when she got her first digital single-lens reflex camera. Last year, Li entered some of her work into the PIP, and this year, she organized the photography show with her companions. Talking about the theme of the association's photography show "JELLO", Li said that it has the meaning of "cohesion", and that she thought photography and the association also represented a kind of cohesion. Money is a problem for high school students. Li said that they accumulated funding for activities by selling hand-made postcards. The five sets of photos on show were selected by members through submissions and voting. Guo Bohua, one of the photographers of the association, said that he likes documentary photos, and his work captures people at different ages. "Children make us feel young and lively, middle-aged people give us a feeling of responsibility and power, and seniors make us aware of the wisdom that comes with the passing of time," said Guo. PIP has attracted more than 42,000 photographers from China and abroad with over 200,000 photographs exhibited since 2001. Around 4.2 million visitors have attended the event. Also, more young people are taking part in the activity. Yin Yunge, a student from Wuhan College of Media and Communication in Wuhan, Hubei province, together with her schoolmates, came to the photography festival for the first time to exhibit their work. "We finished our work under the guidance of our advisors, and we hope to learn more from other photographers at this exhibition," said Yin.